Bed bugs produce an allergenic chemical called histamine to help them aggregate in sites like this mattress welt. Researchers worry that histamine may be adding another environmental allergen to our homes, like dust mites and cockroaches. Until now, if there was one positive thing that could be said about bed bugs, it might be that they haven’t been found to carry communicable disease. The impact of bed bugs seemed mainly to come down to sleepless nights and the economic sting of pest control expenses. But newer studies seem to point to a darker side of these blood sucking pests. 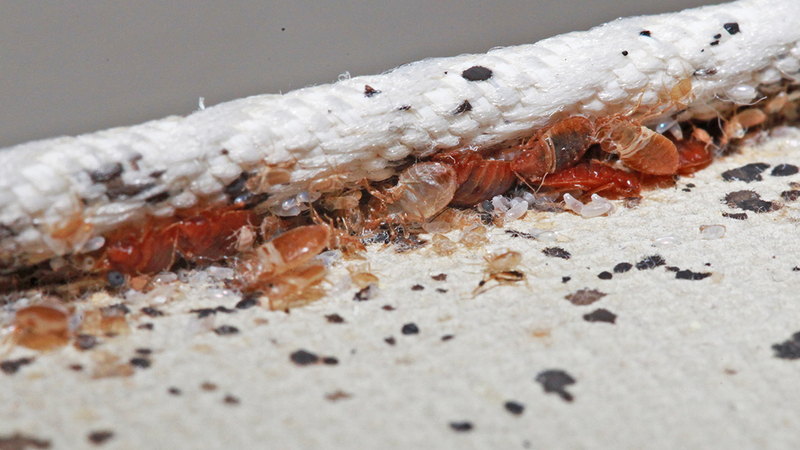 In 2011 Mississippi researchers Jerome Goddard and Richard deShazo scored postings from three popular bed bug websites. They determined that nightmares, insomnia, anxiety, personal dysfunction and other psychological problems were common among online visitors. Some visitors to the sites were so severely shaken by their bed bug experiences that they scored high on a scale for posttraumatic stress disorder (PTSD). In addition to mental health impacts, in 2014 bed bugs were implicated as potential carriers of the Chagas disease pathogen, Trypansoma cruzi. Michael Levy, one of the senior authors of the study, said “we’ve now shown that the bed bug can acquire and transmit the parasite [in mice].” But it remains to be seen whether bed bugs can pass the parasite to humans. Currently Chagas disease is only known to be transmitted by kissing bugs–large blood sucking parasites most common in Central and South America. If enough people with Chagas disease are exposed to, and fed on by bed bugs, it’s theoretically possible that bed bugs could become a more important vector of the disease in the U.S. than kissing bugs. Also, we now know that the causative agent for trench fever and several other diseases, Bartonella quintana, can be acquired and passed on in bed bug feces. The effects of trench fever range from mild to severe, even fatal. The disease has dogged soldiers in wartime for centuries, but until now doctors believed the pathogen was solely transmitted by body lice, insects prevalent among refugees, the homeless, and soldiers in camps and trenches. In a series of studies over the past six years researchers have been finding the bacteria in unexpected places. Traces of Bartonella DNA have been detected in head lice (like bed bugs, not common disease carriers), ticks, mites, and even cat flea feces. Now the focus is on bed bugs. In 2015 French scientists found the bacterium could survive in bed bug feces for up to 18 days. As with Chagas disease, the evidence falls short of proof that bed bugs do or can carry this disease to humans; but in light of the ongoing bed bug epidemic, the data are worrisome. Finally, thanks to a paper published this month by entomologists at the University of North Carolina, we now know that bed bugs are a major indoor source of the allergy-provoking chemical, histamine. Histamine was recently found to be one of the chemicals bed bugs use to attract other bed bugs into aggregations. In this study researchers collected house dust from homes both with- and without-bed bugs, and tested the dust for histamines. “Histamine levels in bed bug infested homes were at least 20 times higher than histamine levels in homes without bed bugs,” said Zachary DeVries, lead author of the paper. Even worse, histamine levels remained high, even three months after homes were treated with heat treatments. “Histamines are used in skin and respiratory allergy tests… they cause a bump in skin tests and restrict breathing in respiratory tests,” DeVries said. In addition, he notes in the paper that histamine exposure can result in thinning of the epidermis, possibly posing significant skin effects. While this study didn’t look at health effects among people living with bed bugs, they speculate that risks posed by bed bug-produced histamine could rival the allergy- and asthma-causing effects of cockroaches and dust mites. They worry that because bed bugs live in bedrooms, where we spend the most amount of time indoors, the impacts might be multiplied. This should remind us of our history with cockroach allergens. Not until the mid-1990s did public health experts and entomologists prove that cockroach allergens have a major impact on human health, especially in big cities. We’ve never looked at cockroaches in quite the same way since this discovery. We may eventually have to rethink the way we think about bed bugs. Until then, keep tuned into bed bug news and continue to hone your bed bug fighting skills. After all, who more than your customers deserves a good night’s sleep? This entry was posted in Newsletter and tagged allergens with bed bugs, allergy-provoking chemical, bed bugs, histamine. Bookmark the permalink.